This article is a short summary of Super Mario Sunshine. Super Mario Sunshine is the second 3D platform game in the Super Mario series, released for the Nintendo GameCube, and the successor to Super Mario 64. The game is based around using F.L.U.D.D., a back-mounded water pump, for platforming and puzzle solving. 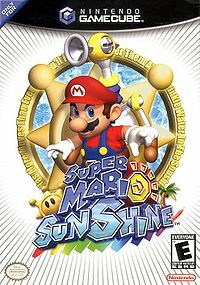 In addition to introducing a number of characters and concepts to the Mario franchise, Super Mario Sunshine is also the second Mario game to make use of extensive voice acting. Dark Days on Isle Delfino! When Mario arrives on tropical Isle Delfino, the once-pristine island is polluted and plastered with graffiti. Even worse, he's being blamed for the mess! Now instead of enjoying a relaxing vacation Mario has to clean up the place and track down the real culprit. Mario, Princess Peach and a group of Toads, including her steward Toadsworth, head to the tropical paradise Isle Delfino on vacation. When they arrive, however, they find that the island has been covered in graffiti, which has also caused the source of the island's power and sunlight, objects known as Shine Sprites, to scatter. Mario has been falsely accused for this crime, the real culprit being a shadowy doppelgänger wielding a paintbrush, and is placed under arrest. Mario is now tasked with using his new water pump F.L.U.D.D., which he finds on the airstrip at the beginning of the game, to clean the island while also trying to chase down and stop the real culprit, who is simply known as "Shadow Mario", as he kidnaps Princess Peach. While many of Mario's abilities and mechanics from Super Mario 64 return in this game, the prominent new feature for this game is the F.L.U.D.D. Mario uses the device to spray water to stop enemies and clean up the graffiti spread across the island. The F.L.U.D.D. has two main nozzles for water spraying: the Squirt Nozzle, which allows Mario to move and stand in place and squirt a continuous stream of water directly forward, and the Hover Nozzle, which allows Mario to briefly hover through the air by pumping water toward the ground to keep him in the air; the player can switch between the two nozzles by pressing Y. Two additional nozzles can also be unlocked: the Turbo Nozzle, which allows Mario to travel at high speeds, and the Rocket Nozzle, which boots him high into the air. The game is set on Isle Delfino, rather than the Mushroom Kingdom and Peach's Castle. Mario travels around the hub area of Delfino Plaza and, similar to Super Mario 64, travels from location to location on the island by jumping into portals painted onto the walls, additional worlds being unlocked as the game progresses by collecting Shine Sprites. EU: 2003 A re-release of the game under the Player's Choice branding. A North America only packaging of Super Mario Sunshine with the Nintendo GameCube. This page was last edited on 27 October 2018, at 17:18.